The last time I went in search of ice-cream in Covent Garden to sample I got lost. Instead of ending up at Scoop, I ended up at All Saints on Regents Street. Almost two weeks later, I still have no idea how this happened. Instead of spending £3.50 and gaining a couple of hundred calories, I gained a very nice pair of boots and dropped £195 from my bank account. I was happy with this arrangement, with the exception of the exchange of notes for leather. Though the leather brings happiness to my life. The following week I went in search of ice-cream once more. I started at Scoop just off Endell Street. As I had just finished a swim at the Oasis outdoor heated pool nearby I felt as though I had earned my sugar rush. Now I love tasting gelato. At a 4 day wedding in Rome last summer, I spent one full day traversing the cobbled streets in search of the perfect ice-cream. I was spoilt for choice. In sampling and comparing I like to use coconut and pistachio as my core flavours. At Scoop there was no pistachio on offer so I sampled the coconut. At £3.50 for a small tub it’s certainly pricey. When you consider that Harvey Nichols sell excellent ice-cream at £2 a pop, the difference in price is substantial. 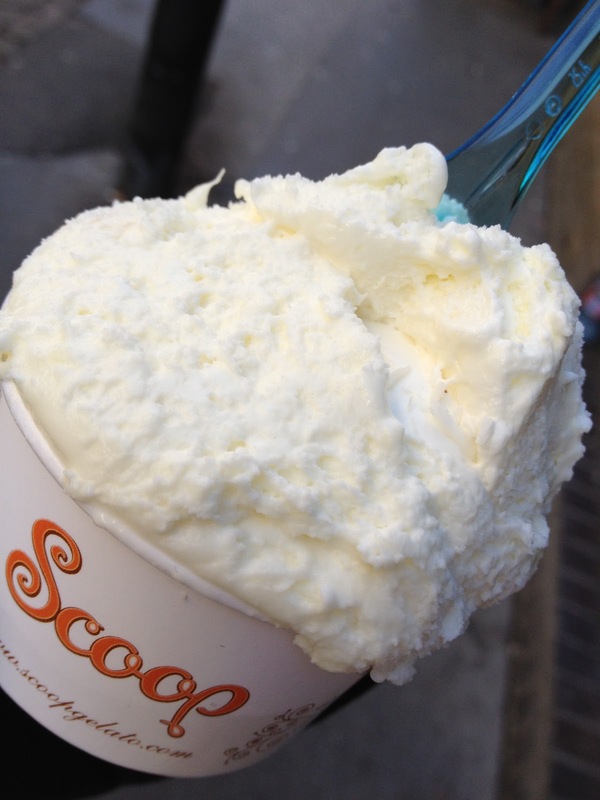 The taste and texture of the gelato at Scoop was affected by the coconut pieces in the ice-cream in a positive way. It was quite tasty but I did get an aftertaste which left the impression on me that there were some artificial additives in the ice-cream. There was certainly something not quite right about it. I continued on my merry way, and just a few blocks due south, another gelato shop can be found on Russell Street. 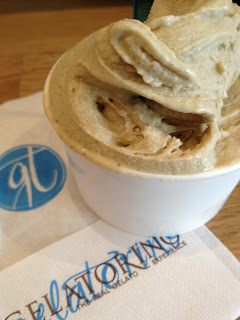 Gelatorino hides its ice-cream in covered vats. The gelato is made on premises. The flavours on offer included pistachio, and it was to this I veered towards. A small scoops costs £3 so again it’s pricey but wow when it appeared from beneath the covered vat it was an impressive sight. The gelato had a brown/green tinge to it, and my goodness it was delicious. It had a velvety texture with pieces of pistachio throughout. Each taste only served to enhance the flavour. As I indulged, an Italian customer arrived into the shop to order his own gelato and converse with the assistant in Italian. The proof of the gelato I suppose is in the Italian. 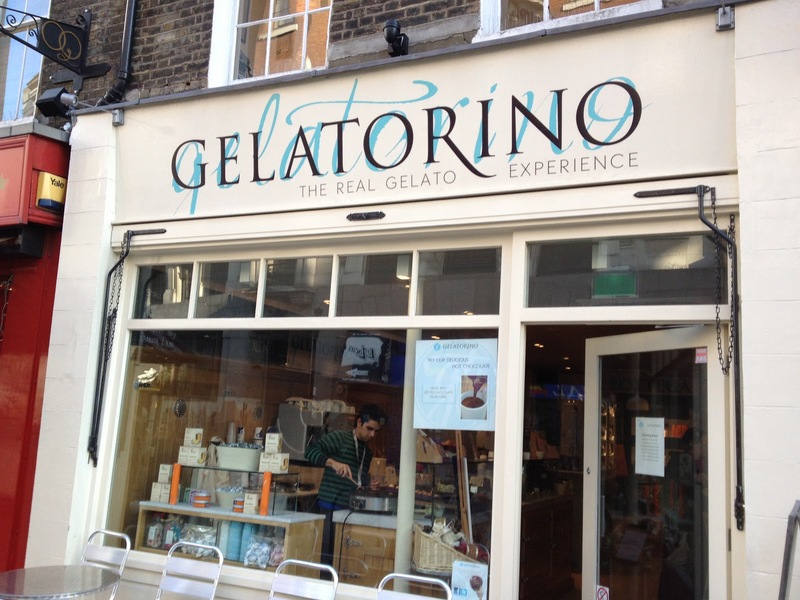 In the Covent Garden stakes for ice-cream, Gelatorino is the clear winner by a country mile. It’s certainly not cheap, but it is truly excellent.